The Crumpet: Zoya Caitlin - Rebooted! Weirdly, I get loads of hits on my blog from people Googling for Zoya images. More than any other brand. And it really disappoints me that 2 of my favourite Zoyas have sucky posts because they were amongst the first that I did. So, I’m gonna sort that out, and Caitlin is the first polish to get rebooted (don’t worry, it didn’t hurt). Caitlin is from Zoya’s 2011 INTIMATE Collection (all 6 are utterly fabulous). 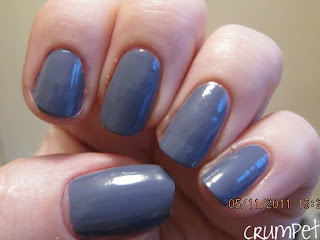 It’s pretty much the perfect dark lilac because of its smokiness, and lacks the brightness of OPI’s Planks A Lot. This is very similar to Kelly in that it looks like a plume of coloured smoke (this one hued with lilac; Kelly hued with purple) and again, looks darker on than it does in the bottle. 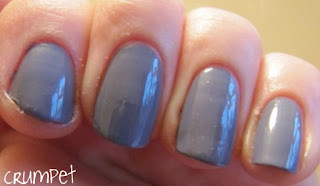 Caitlin is a smoky lilac on top of a medium grey base and she is just super elegant and refined. There’s an aloofness about her that I find really appealing, and if she were a woman, she would definitely be rocking a twinset and pearls. It’s a shame, because since her birth, Caitlin has been duped to death and spawned so many other clones. Right now, you can buy dozens of similar shades to this, and that really does dampen how special she is. I don’t care how many other greylacs you have, CAITLIN is the one you need. She is the original, and therefore the best. Personally, considering they already had Caitlin and Kelly, I really don’t know why Zoya bothered to do Smoke & Mirrors (beautiful though those polishes are). These 2 would have fitted into that collection perfectly. The perfect combination of subtlety and pigment. And if you want to have a laugh, the original post is here. Finally, me and Konad the Barbarian have been trying to forge a relationship. So far, he’s a typical bloke, great at first (see thumb) and then disappointing, patchy and unreliable lol. We are currently not on speaking terms.